- We only keep your information in our database if you sell to us, but you can opt-out of receiving communication at any time. Within 1-2 business days of receiving your submission, one of our expert buyers will contact you via phone or email with a proposed offer range. The greater the condition, the higher the value you can expect to get. If you accept our offer range, we will email you a pre-paid UPS shipping label. Carefully package your watch so that it is safe and secure inside the box. If you have the original box and papers, please include them as well. Drop it off at your nearest UPS Customer Center- not the UPS Store. To find your closest UPS Customer Center, please click here. If at any time in the process you decide you no longer wish to sell your watch to us, let us know and we will ship it back to you with no questions asked. 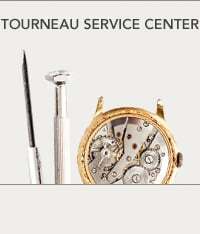 Once we receive your watch, we will carefully inspect its authenticity and condition. After the watch has been inspected and approved, we will contact you with the final offer. Once you have accepted the final offer, a check will be sent to your home. Visit one of our stores nationwide and speak to a manager. You will be asked to present your watch in order for our experts to make an accurate assessment of its value. Upon careful inspection of the watch, one of our experts will provide you with its exact value. You will have the option to either receive a check or 20% additional value towards a trade-in. 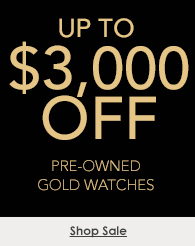 Once you accept our offer, you will hand over your watch to our expert buyer to be sent to our inspection facility. Once you have accepted the final offer, a check will be sent to your home. If you opt for the trade-in, you can purchase a watch that day or receive store credit for the future. Follow these simple steps to begin the watch selling process. The watch manufacturer that is typically found on the dial of the watch. Consists of a combination of letters and/or numbers that are found on the back cover of your watch. Are original watch box and/or papers available? Upload Watch Images Click Upload button below to select the image file. Accepted image file types are jpg, gif, or png.